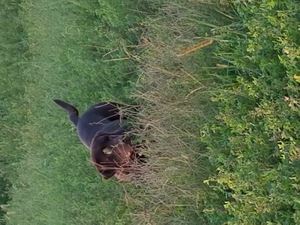 Zuma is a complete package when looking for a chocolate pointing lab to use as a stud. In fact, he is an impressive package even with out being chocolate. To start with what he is capable of in the field. As a retriever, he is an excellent marker that runs blinds as hard as he does a mark. He is an enthusiastic dog whether running drill work or live fliers. He flat loves to retrieve. He is the type of dog that if he sees a bumper laying on the ground he will pick it up and bring it to you, begging to train. In the upland field he is a thing of grace and beauty. He will run big (how he is naturally) but will also stay tight when conditions warrant it. This past fall in APLA tests, one observer asked my why I wasn't running tournaments with him..... I said I had thought about it, he responded, "you need to do more than think about it." Another run as we left the field, the gunner ( a tournament hunter himself) who had watched the whole day told me, "If he had a little more hair he would be the perfect lab." I reminded him it was still summer, check back in January when he had his winter coat. Clear back to his Certified run as a 12 month old, Zuma turned heads in the upland, "That was impressive" was the quote leaving the field. Zuma is the type of dog on wild birds you can have a great hunt watching him work hens and never shouldering the gun. His FIRST wild bird, he trailed for close to 200 yards before getting it circled back towards me where he pinned it down with a staunch point. He is so staunch in fact, last year I took pictures of his point on most of the birds we shot. One 3 hour stretch with quail last winter saw him with 18 points, I had decided not to shoot into that covey much, but man we had fun working them! He will hold as long as needed. And will maintain that standard for whoever is running him..... Last day of the season last year, I returned home from work noticing that my gun, and vest had been moved, and that Zuma was not where I left him. Turns out Dad had seen some birds while picking up bales and went and grabbed Zuma, my gun, and my vest from the garage. Zuma had pinnned the bird in the bottom of a ditch..... Dad almost complained that he had to go into flush the bird, and then it took him a minute to remember to release Zuma for the retrieve. Perfect bird manners for someone that had never put him on a bird alone before. Combine all that with his being great with our kids and toddler in the house. His pedigree speaks for itself. The son of 4XGMPR Grass Lake Greeley MH and 4xGMPR HRCH GMHR-I Baier's Lady Legacy MH, those two dogs alone speak volumes, combine that with Greeley being Sired by Stormin Norman and going back to a FCXNFC breeding on the bottom side, Greeley is what some would consider more of a field trial breeding. Lacy Is out of our own GMHRCH-II MPR Beamer and is currently the only living dog with master titles in AKC, HRC, NAHRA, and APLA. Zuma combines Lacy's intense desire to please with Greeley and Beamer's intense bird drive. It is hard to imagine a better blend of those two very important traits. Looks, I always say no matter how great of a dog it is, I have to look at it 365 days a year. And Zuma is easy on the eyes. He has a classic Lab head without being overbuilt. He is an extremely athletic 68 pounds, with conformation that allows him to move with grace and ease. Not the Huge boned heavy built show dog, but not the grey hound build either, a nice moderate package that looks the way a lab should look. Search #zuma for more pictures of him. Clearances, in this day and age there is no excuse for not having clearances done. While I am not one to rule out breeding dogs that are a carrier of certain genetic traits, having a dog that checks all the boxes so to speak and backs it up with a perfect set of clearances is icing on the cake. Clear of all genetic abnormalities on the Paw Prints Essential Lab panel, excellent hips, normal Elbows and normal eyes. Dillute free. BTW, the picture on this post, his first bird contact in 6 months, and one of two before going 4/4 in APLA tests this fall. That is all natural. If considering Zuma for your female I would be happy to answer any questions. Links to his OFA and Paw Prints panel are located on the link below with his pedigree.